Discussion in 'Ski Essentials: Special Sale Forum' started by Tricia, Aug 29, 2017. As many of you know, Pinnacle Ski and Sports in Stowe VT, is associated with SkiEssentials . Some would say that they are close cousins. Steve, from Pinnacle was faced with a house fire yesterday while he and his wife were taking their 6 week old baby to the doctor for check up. Please do what you can to help him and his young family get through this. Been to Pinnacle Ski and Sports and talked skis? Chances are, you've met Steve. He's the man that keeps the place running, works with you to get you out on the slopes, and has been "Mr. Stowe" for two years running. "I sell having fun," he'll tell you "what could be better than that?" Having a son probably tops selling fun... and Steve and his wife Nielle had a baby boy six weeks ago, little Wyatt Sulin. Steve and Nielle returned this afternoon from a well baby doctor's appointment, to this. The house fully engulfed in flames. They have what they were wearing and what they took to the doctor's office... that's it. The house is completely gone. They'll need a place to stay, emergency baby supplies, clothing... and your love, support and help. Please, do what you can. I have no idea what it will take to meet their immediate needs, but this is a start to putting them back on their feet. Thank you, for what you can do. Snowfan and Mendieta like this. Snowfan and Tricia like this. Tricia, Philpug and Mendieta like this. Thank you to everyone who has reached out with well wishes and generous donations. Steve's father is coming up, and thanks to Carrie Nourjian and the Commodores Inn, has a place to stay (thank you!). 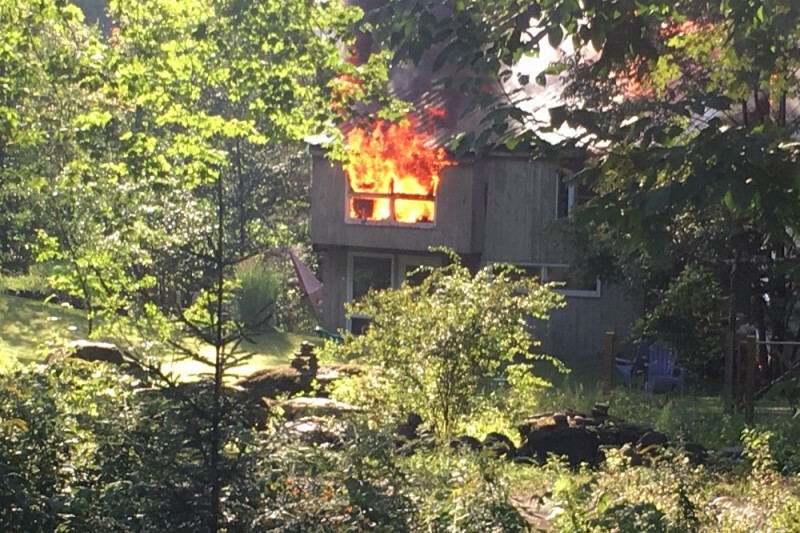 The Stowe Reporter has additional information on the fire up on their website, and Steve, Nielle, and little Wyatt spent the night with family. People have asked if they can donate baby things. Wyatt is in the 0-3 month size, and infant diapers. Diapers. Diapers. Did I mention diapers? Can be dropped off at Pinnacle Ski and Sports. If you'd like to bring items for an older baby, could you bag and tag so we can set those aside for a couple of months? They'll need them, but obviously don't have a place to store them right now. The suggestion to coordinate with an Amazon Wish List has been adopted, but it is going to be some time before Steve and Nielle have clarity on what they'll need going forward. We'll let everyone know if and when such a list is possible. In the meantime, they're grateful and humbled by your outpouring of affection. Thank you all so very much for coming so quickly to their aid. It's a lovely early autumn day here in Vermont and we know more this morning than we did yesterday. The good news is.. the kitchen, and nobody knows why, largely escaped the fire. So all their kitchen gear is salvageable, and Steve was over at the house yesterday collecting that. I learned this before I gave in to my natural inclination to buy them a crock pot... but as all of you know, replacing you kitchen is a fiddly, costly, pain, so the fact that it is largely salvageable is good news. The rest of the house... the insurance has written the house off as a complete loss. However, thanks to the combined efforts of a number of people, including a nice family who rushed off at 7 pm last night to buy blankets, an apartment has been donated, a bed found, and this morning volunteers are installing the bed and dressing it with all new bedding so they'll have a place to come home to tonight and some breathing space. Laura, at Pinnacle Ski and Sports, is maintaining a database of baby supplies and gifts people are thoughtfully donating to help little Wyatt. We are doing our best to avoid duplication, so if you have something someone has already gifted we're going to encourage you to donate it to United Way or other local charity for the next family to find themselves faced with a crisis. Pinnacle is open 9:30-5:30, but please give Laura a chance to get organized, and come in after 10! If you're far away... Pinnacle's mailing address is PO Box 1507, Stowe, VT 05672 We thought it would feel like a warm hug if they received cards and notes they could open. Please be sure to address the card to Steve Sulin so we don't think it's a bill! I'd like to take this opportunity to thank you all again for your outpouring of kindness and support, and as we know more I'll keep in touch. SkiEssentials, Mendieta and surfsnowgirl like this. Here is one more update, in part to bump this thread. Please share in social media, particularly among skiers, who understand this industry, and know that nobody owns a local ski shop to become a billionaire, but rather our of love for the sport. It's great to see the community support them so well. almost 80% of the funding goal has been achieved in five days. Yay! The fact that your first post was that one ... already says a lot. Welcome home. Way to get started! Oh man!........just got on here and saw this............ You da Man Steve! Also glad nobody was hurt!